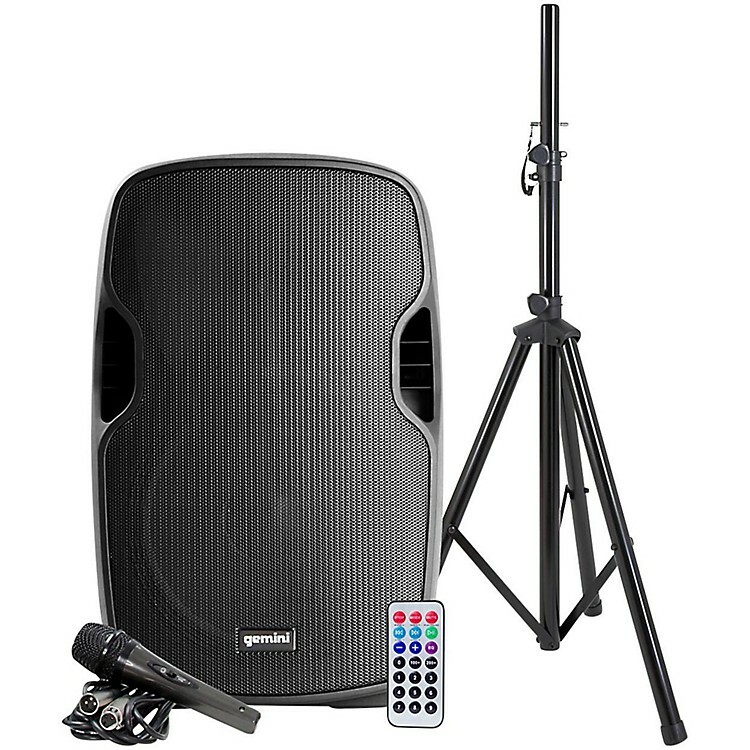 Lightweight, affordable powered speaker with 12" LF driver, speaker stand and mic with cable. The Gemini AS Series continues in Gemini’s defining mission of providing professional DJs, entertainers, venues and business presenters with reliable, well-constructed sound reinforcement equipment at an affordable price. The AS Series is available in passive and active configurations, the active configurations additionally having Bluetooth connectivity as an option. This one, with the PK delineation, includes a speaker stand and a wired microphone. This is the Gemini AS-12BLU-PK, a 2-way active PA speaker with 1500W peak Class AB built-in power amplifier. It has a 12” woofer with 2” voice coil and a Piezo compression driver, and delivers a linear frequency response between 40Hz-19kHz. There are two mic inputs, both line and XLR, ¼ in. and RCA along with an LED clip alert light. Each input features high and low EQ. The AS-12BLU-PK is additionally equipped with Bluetooth connectivity, which lets you stream music wirelessly into the system from your handheld audio device, be it a phone, computer or dedicated media player. This is especially handy for karaoke, playing recorded music between sets or playing recorded presentations for business meetings. It has a wide dispersion horn with forward firing bass reflex ports, and ABS impact-resistant nylon fiber cabinet, and top and side handles for easy carrying. Speakon input and output connectors, flyable and stand mountable. Compact and lightweight, this size is great for gigs, rehearsals or installations. Comes with Bluetooth, a speaker stand and a microphone with cable.